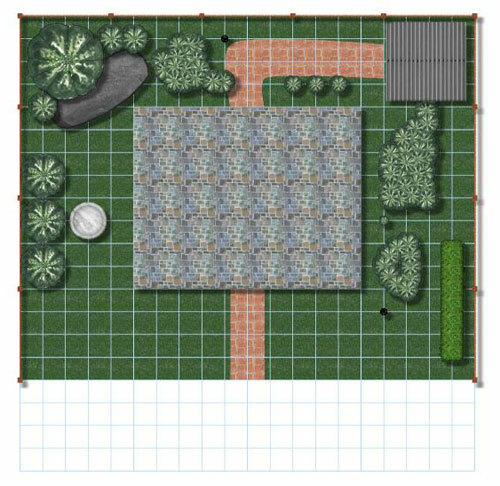 This free landscape design plan is purposed for small and tiny gardens of town-houses or homes with shared gardens and lawns mainly located in big cities like London, Toronto, New York, Montreal, Chicago which are mainly in the northern part of North America and Europe, and can provide sufficient humidity for the plants to grow fast and to keep the grass green all year round. The patio is planned to be covered with decorative stones which are available at any store in your area. The preparation for this garden is pretty simple: you have to plant grass which can be found in every retailer at minimum prioces usually in the early spring every year in the outdoor sections, and depending on the usage can be selected different types of grass and fertilizers for the ground. 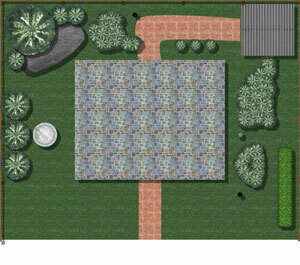 This garden plan is easy to be developed after al the necessary materials for building the patio are found. The garden path can be made from variety of building materils like stone, bricks, wood and even concrete tiles with decoartive and aesthetique shape. The most difficult part is the olanting of the trees and laying of the big decorative rocks. Please do not hezitate to contact us with your questions or if you prefer you can apply and receive your free copy of this garden plan. Before you start to dig in the ground find a good leveler so in case there are hard rains it will not cause you garden to be flooded, and with appropriate angle the water will irrigate the grass and the other plants.